In 1982, the MBCYC joined forces with the Union United Church Senior Choir in a joint concert, directed by Prof. Payne, to celebrate the 75th Anniversary of the oldest Black church in Montreal. The success of this event, which included Oliver Jones, Ranee Lee and Charlie Biddle, launched the Payne-led Montreal Jubilation Gospel Choir to its current status as one of the world’s finest Gospel choirs. The choir’s initial recording, Highway to Heaven, was recorded live and released in 1986 by Justin Time Records. Licensed in Europe to Enja Records,, it has sold 60,000 copies in Europe alone. In the same year the choir was awarded the “Outstanding Recording Artist Award” from the Association of Gospel Music Ministries. The choir’s sophomore album, Jubilation ll, released in 1988 to unanimous acclaim, marked it’s first Juno Award nomination, and the choir supported that record by touring in Germany, in the U.S. and throughout Canada. The third recording, Jubilation lll – Glory Train, (1990) was the choir’s first studio recording and was the first of its three records to be released in the U.S. In the same year, the MJGC was asked, along with the Bulgarian Women’s Chorus (of “Le Mystère des Voix Bulgares” fame) to contribute one track to the three-CD box set, Voices, an award-winning compilation of the world’s best choral music. The Montreal Jubilation Gospel Choir has performed for various heads of state, including Nelson Mandela during his 1989 visit to Canada, and Queen Elizabeth II. They have performed with, among others, Céline Dion, Foreigner, New Kids on the Block, Michael Bolton and Ray Charles. The choir entered the studio in April, 1992, to start work on what was to become the A Cappella recording, Jubilation IV, which was released in November of that year, to coincide with their seven-city tour of Germany. While there, the choir took part in the recording of Klaus König’s oratorio, The Song of Songs, which was also performed live in several cities, including Berlin. This work is scored for two solo voices, gospel choir and jazz orchestra, and the compact disc of this great work was released in Canada by Justin Time in June of 1993. The choir’s JUNO award recording, Jubilation V – Joy to the World, was originally intended to be a Christmas record, but it is definitely one which can be enjoyed all year round. It features such tracks as “Geographical Fugue for Speaking Chorus” and their version of “Amazing Grace” proved the choir to be at the top of its power. Indeed, as Canada’s music business trade, The Record, stated in their review, “The Choir has now moved well beyond their original black roots.” This is, in fact, more of a choral “world music” album. This recording was awarded a Juno Award for ‘Best Blues/Gospel Album’ in 1995. Jubilation Vl – Looking Back released November, 1996 is a comprehensive musical portrait, spanning the choir’s 20 year history, from 1974, when they were known as the Montreal Black Community Youth Choir, right up to their release, Joy to the World. It was painstakingly re-mastered, and features previously unavailable studio alternate versions, in addition to rousing live tracks. The 44-page booklet that accompanies this special 2-CD package features liner notes in English, French, Italian and German (the choir’s recordings are distributed internationally). Jubilation Vll – Hamba Ekhaya – Goin’ Home (1997) represents the culmination of a long-standing dream for Trevor Payne, begun 15 years ago at Union United Church in Saint-Henri. Today he has brought the Montreal Jubilation Gospel Choir full circle, taking the Lord’s blessing and the indestructible beat of Saint-Henri home to Africa, and into our hearts. With the dawning of the new millennium, the Montreal Jubilation Gospel Choir has expanded its horizons to include appearances and collaborations with icons in the classical music field including the Metropolitan Symphony Orchestra and I Musici of Montreal. 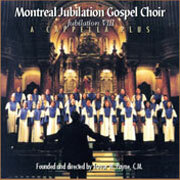 Jubilation VIII – A Cappella Plus is a superb follow-up to the Choir’s Jubilation IV A Cappella; on this recording, the 35-member Montreal Jubilation Gospel Choir employs 13 instrumentalists as well. The sound of A Cappella Plus is rendered more eclectic by some unusual instrumental accompaniments: for example, Martin Luther’s “A Mighty Fortress Is Our God” features a saxophone quartet, while “Great Day” is accompanied by a street band in the New Orleans tradition, while Beethoven’s “Hail Mary” features a bassoonist and African kora among other instruments. With the release of Jubilation IX: Goin’ Up Yonder, Prof. Payne introduces to the world his latest musical gem: Revelation III. This stunning vocal trio (Serena Voltaire, Samantha Hinds and Janique Montreuil) became the centrepiece of the MJGC’s present incarnation. Revelation III’s primary influence is gospel’s legendary Barrett Sisters, who debuted in 1962, but whose roots trace back to Chicago in the ‘40s. Once again, the Montreal Jubilation Gospel Choir brings into being classical gospel music at its finest. Jubilation X: I’ll Take You There, is the Choir’s 10th recording. Prof. Payne, the Choir’s founder and director, has dedicated this offering to some of the musicians that helped shape his career: Ray Charles, Cannonball Adderley, the Staple Singers, Curtis Mayfield and Jimi Hendrix. The Choir is joined by Dave Turner (who provides the ‘Cannonball’ touch), the legendary Fontella Bass (taking on the Staples’ legacy) as well as guitar virtuoso Frank Marino. A Celebration In Time (2010) is one of the most ambitious projects ever produced by Justin Time Records, and showcases the artists who’ve been an integral part of the Montreal-based label’s storied history since its founding in 1983. In top form are piano giant Oliver Jones; chanteuse extraordinaire Ranee Lee; and the internationally renowned Montreal Jubilation Gospel Choir, directed by its founder, Trevor W. Payne. Also performing are the spellbinding Daphnée Louis Singers (DLS), direct from Haiti, performing “Gras Bondye.”The recording, consisting of both standards and new compositions, all in a seasonal vein, is sure to become both an instant classic as well as a solid retail item, considering the proven sales histories of Mr. Jones, Ms.Lee and the Choir, each of whom are also Juno Award winners, Members of the Order of Canada, and recipients of the Queen’s Jubilee Medal.